Book 1 of "Codex Alera"
SYNOPSIS - For a thousand years, the people of Alera have united against the aggressive and threatening races that inhabit the world, using their unique bond with the furies - elementals of earth, air, fire, water, and metal. But now, Gaius Sextus, First Lord of Alera, grows old and lacks an heir. Ambitious High Lords plot and maneuver to place their Houses in positions of power, and a war of succession looms on the horizon." "Far from city politics in the Calderon Valley, the boy Tavi struggles with his lack of furycrafting. At fifteen, he has no wind fury to help him fly, no fire fury to light his lamps. Yet as the Alerans' most savage enemy - the Marat - return to the Valley, he will discover that his destiny is much greater than he could ever imagine." Caught in a storm of deadly wind furies, Tavi saves the life of a runaway slave named Amara. But she is actually a spy for Gaius Sextus, sent to the Valley to gather intelligence on traitors to the Crown, who may be in league with the barbaric Marat horde. And when the Valley erupts in chaos - when rebels war with loyalists and furies clash with furies - Amara will find Tavi's courage and resourcefulness to be a power greater than any fury - one that could turn the tides of war. In for a sheep, in for a gargant. Because a sound tree doesn’t have bad roots, Amara. No enterprise of greatness begins with treachery, with lying to the people who trust and love you. The course of history is determined not by battles, by sieges, or usurpation, but by the individuals. The strongest army is, at its most basic level, a collection of individuals. Their decisions, their passions, their foolishness, and their dreams shape the years to come. If there is any lesson to be learned from history, it is that all too often the fate of armies, of cities, of entire realms rests upon the actions of one person's decision, good or bad, right or wrong, big or small, can unwittingly change the world. But history can be quite the slattern. One never knows who that person is, where he might be, or what decision he might male. It is almost enough to make me believe in destiny. I've mixed views on this one. It ain't that I didn't like it, far from it. It's just that I am finding it a little difficult to jump from a Harry Dresden setting into a TolkiEn era. Vast empire, political sabotage, special units, love and loyalty and a magic system that makes the use of Pokemons, or something like that. First things first, politics rule but is overshadowed by sheer action. Hello Tavi, one of the main characters who's furyless. That means, he can't do any special moves with Pokemons. Almost everyone in the Empire has one or more furies. Furies are elemental. Earth, wind, wood, fire and whatnots. Each fury elemental is different and has different abilites. Fury crafting of earth summons an earth animal/giant/pokemon. Firecrafting plays with emotions, watercrafting lets you control the water and use it mainly for healing purposes. Blah Blah Blah. And then there's Tavi, without a spark of fury in his blood. And Amarra, who's a Cursor and a windcrafter. Cursors are the elite special forces of the realm. More like Aurors, only way cooler. You need to read this one. ASAP. Back to the book then. 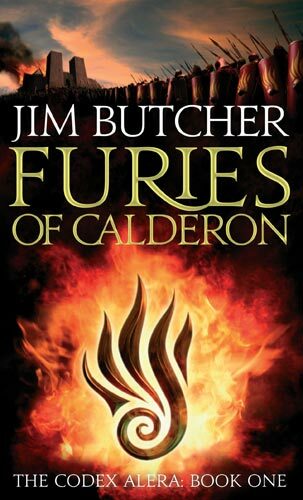 Furies of Calderon is an apt title for the war in Calderon Valley. Months of planning and scheming, a fearful enemy force and the might of the will clash at this iconic valley. The war scenes are gory, as they ought to be. Jim Butcher doesn't shy away from deaths and barbaric rituals. Furies of Calderon transported me to a world where I wanted to root for the underdog despite knowing that it might not be the best. For my heart and the Realm. For any fantasy series, foreshadowing is a vital element. Some half-truths, some whispers in the dark and a lot of missing information made sure I picked up the second book. There is love in the air and fear in the wind.